Mensusa https://www.mensusa.com/articles/look-appealing-pairing-the-tuxedo-with-mens-double-breasted-vests.html Look Appealing Pairing The Tuxedos With Mens Double Breasted Vests The combination between tuxedos and mens double breasted vests is a smart way to make an appreciable public appearance. www.mensusa.com has on its strands exotic options on mens tuxedos. The concept of fashion and dressing had undergone significant changes that what it was days back. The contemporary styling and attiring orientations seem to be very attractive and appealing. These changes add flairs to the fashion pursuit of men and elevate the fashion domain to the next level of advancement. One of the new attiring styles that had become very popular in today's time is the combination of the mens double breasted vests with the tuxedos. You can pair any kind of tuxedos with the double breasted vests. Be assured that the pairing would give you an appearance that would appear fashionable and highly stylish. The mens double breasted vests had been traditionally an inevitable component of the 3-piece suits. On the other hand, Tuxedo is one among the suits that holds relevance to the formal as well as the casual dressing style. Hence, the combination includes the good of both the formal and casual attiring. Making the public appearances in this combination, you can be assured that you would look fashionable, stylish as well as it would uphold a matured and elegant taste. The combination would surely accentuate your appearance in a style that your presence would get noticed and appreciated. You can pick of tuxedo for pairing with the double breasted vests, keeping a balance between the shades and design of the two. 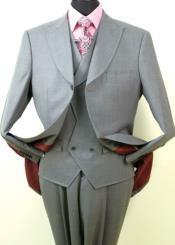 For example, the combination between the grey tuxedo and mens double breasted vests can be a ravishing approach in attiring. Just you require choosing the perfect contrast between the tuxedo and the vest that you pair with it. The double breasted design of the vests and the grey shade of the tuxedo make the combination an ideal option for the formal as well as the business dressing needs. The combination would be equally good for attending social occasions as well as the dining invitations, which are the primary purposes of the tuxedo suits. Aside the Grey tuxedos, the navy blue tuxedo is another ravishing option that you can pick for paring with the mens double breasted vests. Navy blue looks royal and elegant and you can wear these tuxedos in the formal as well as casual events. The luxurious look of the navy blue shaded tuxedos make it a ravishing option for the business dinners as well as the promenade occasions, wherein the combination of the tuxedo with the double breasted vests can be a smart choice of attiring to get noticed and leave an impression to the ambiance of the occasion. Choosing the white tuxedo would be a smart act for pairing it with any given shade of double breasted vests. White shaded attires enable you to appear gracious and sophisticated. The combination between a deep shaded double breasted vest and the white shaded tuxedo suit would uphold a matured taste and impressive dressing sense. The combination simply appears to be eye-catching that eases you task to impress the people around you. Irrespective of your age, the spirit of the occasion you are attending or even the time the occasion is hosted, the combination between the white tuxedo and mens double breasted vests would be relevant and conducive to support your styling acumen. The combination of the mens tuxedos with mens double breasted vests is a smart approach to add flairs and grace to your appearance. To appear fashionable, it is important that you adapt with the concurrent fashion trends. The concept of pairing the vests with the tuxedo is something which is prevailing in men's fashion very strongly. Hence, you are ought to try on it as it would display your consciousness on the prevailing fashion trends. At www.mensusa.com you can expect getting the most varied collections on tuxedo suits as well as on double breasted vests. The best point about the store is that it deals with premium grade products and the shop offer these products for the most reasonable prices. Aside, the excellent customer services is a delight to the buyers.